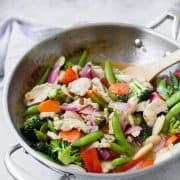 This sweet chili chicken stir fry is a quick and easy healthy dinner that comes together in 30 minutes, is so full of flavor, and is flexible based on what vegetables you have on hand! I’m always on a quest to find quick, easy, and healthy recipes for us to enjoy that won’t keep me slaving away in the kitchen for hours. You guys know this about me, and the chances are good that’s why you’re here, too. Making a stir fry is always sure to be a win because it’s one of those meals where you can do a fridge clean-out. Tofu? 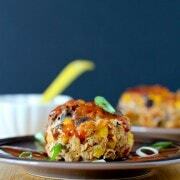 Do it up Meatless Monday style! And then there are the vegetables. Basically, just grab whatever you have in your fridge and throw it in! With that being said, this sweet chili chicken stir fry is an actual recipe and the vegetables I chose are perfectly suited for the sauce I chose. So if you need a starting place, this is a really good one! Speaking of that sauce! I like to cook from scratch when it makes a huge difference in flavor, taste, or health, but I also like to take shortcuts when I can find good quality ingredients to use. As you may or may not know, my son is allergic to sesame and nuts. 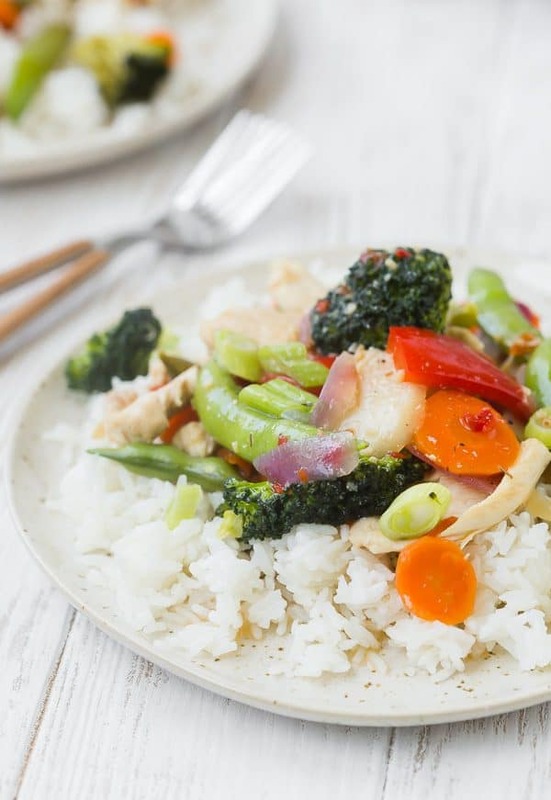 These allergies verrrrry much limit the choices for stir fry sauces as many of them include sesame oil or peanuts. I’m partnering with SpartanNash again (remember the easy chicken alfredo I made with their pasta?) to bring you this post and as I was browsing my local Spartan store (we’re lucky enough to have Forest Hill Foods, Family Fare and D&W all within 30 minutes!) 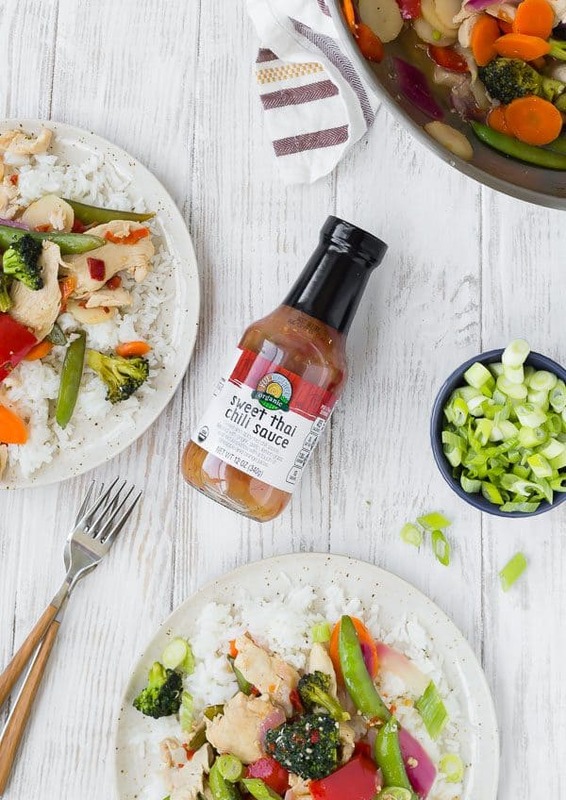 for inspiration for this recipe, I grabbed the Full Circle Organic Sweet Thai Chili Sauce. These are the kinds of ingredients that I’m personally looking for when shopping for pre-made ingredients for my family to enjoy. I can pronounce them all, I know what they all are, and bonus – organic! The next requirement for a store-bought shortcut ingredient such as a sauce is TASTE. Obviously, I didn’t check this one out until I was at home, but we loved the taste of this sauce. It has a great amount of heat but is balanced out by a sticky sweetness from the sugar and fruit juices. It has a really great balance of spicy, sweet, and tangy. We loved it! Another thing I appreciated about this sauce was its thickness. It wasn’t overly thick but it was just thick enough to coat all the stir fry ingredients and still mingle with the bed of rice. 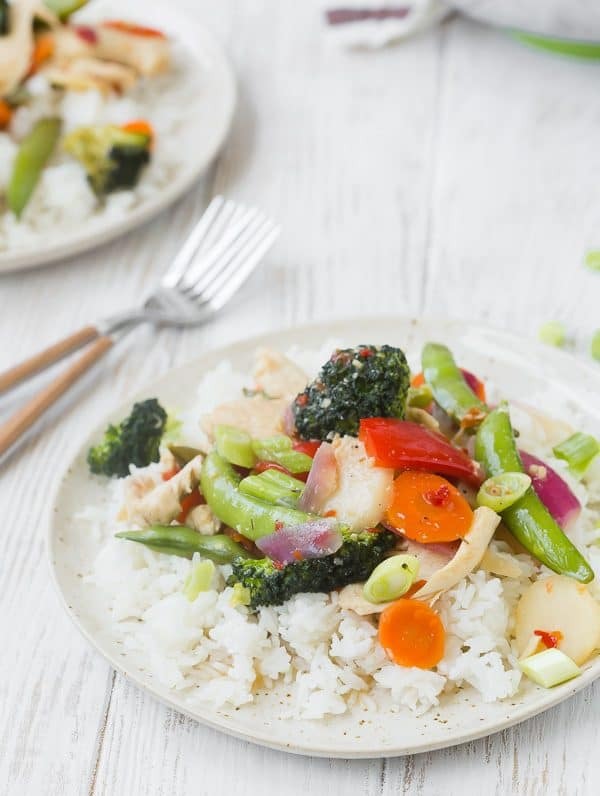 Make this Sweet Chili Chicken Stir Fry your own! Like I mentioned, you could try this with different proteins. I personally would choose chicken, steak, or tofu. I don’t think the sauce would complement steak or other red meat quite as well, but if you want to give it a try, I’m not stopping you! Let us know how it is. 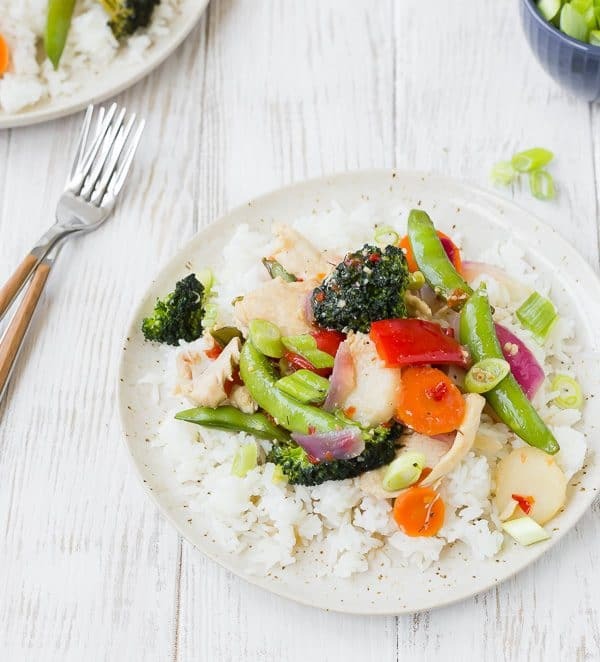 OR, you could try this easy beef and vegetable stir fry! Try different vegetables! I loved this combination, but I’m also a fan of mushrooms, baby corn, and zucchini in stir fry. Celery can be a pleasant, crunchy surprise in stir fry, too! 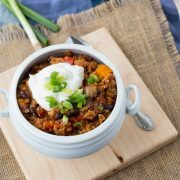 Serving suggestions – I love this with jasmine rice (I adore jasmine rice – watch out for a pressure cooker method coming soon!). You could serve this over cauliflower rice, quinoa, brown rice, or eat it over lettuce. 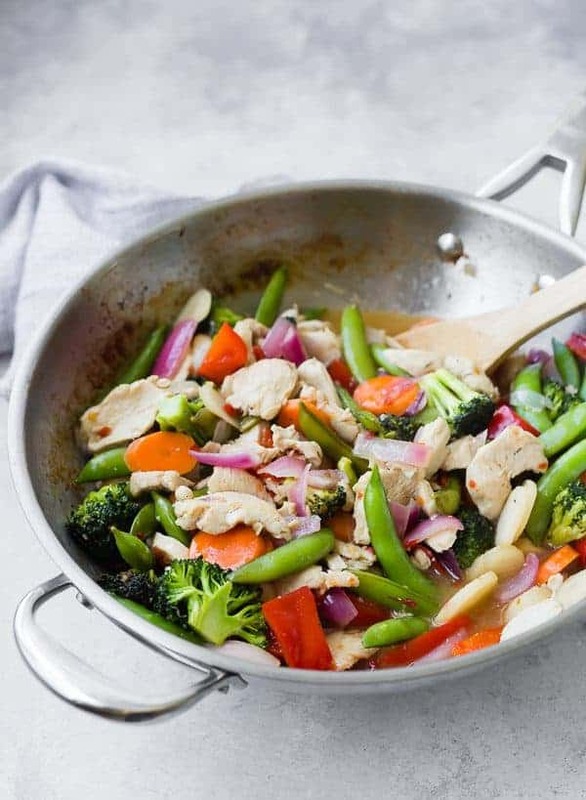 In a large skillet or wok, heat coconut oil over medium-high to high heat. Add chicken and cook for 5 minutes or until browned. Add onion and carrots, and continue to cook, stirring for another 2-3 minutes or until carrots start to soften and onions begin to become translucent. Add bell pepper, broccoli, and sweet peas and cook until broccoli and peas are bright green and tender. Add water chestnuts and Full Circle Organic Sweet Thai Chili Sauce and stir to combine. Heat until sauce glazes all ingredients and is heated through. 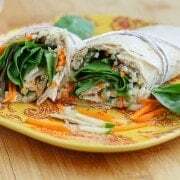 May also be served over brown rice, quinoa, cauliflower rice, or any grain of your choice. You may also use different vegetables. Keep in mind all vegetables cook at difference paces, so if you choose a hard vegetable, add it towards the beginning. If you’re using something softer and more delicate (like zucchini or mushrooms), add them closer to the end. Nutrition info does not include rice. 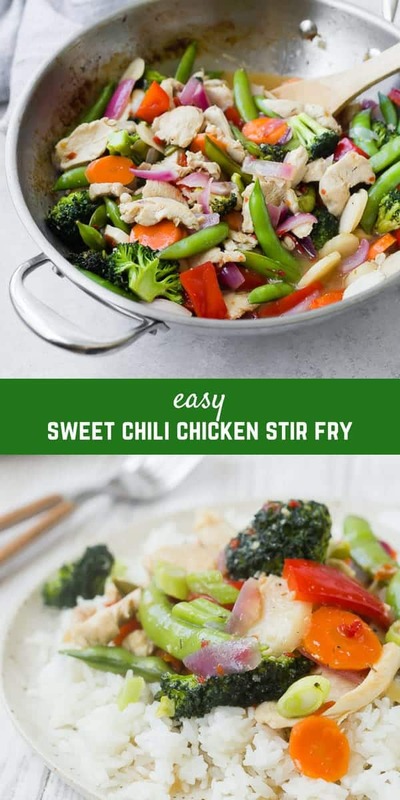 Verdict: I love this sweet chili chicken stir fry! It was so easy to make and leftovers tasted great too. Husband’s take: Ben loved this! He ate the leftovers for days (it makes a big batch!). Changes I would make: None are necessary, but try mixing it up with different vegetables if you want! This content and recipe is in partnership with SpartanNash. I was compensated for my time but all opinions are, as always, my own. Thank you for supporting Rachel Cooks by reading about brands we use and love in our own home. Sponsored posts like these help me cover some of the expenses involved with keeping this site free for you to use! Love how simple and easy it is to put together !